I’m leaving town for a week tomorrow, so it’s been a little hectic with the packing and the cooking and the eating around here. I think I gain weight before going on vacation. We eat more and larger meals trying to finish up our week’s food a few days early. So what to do with this week’s food before vacation? Works best for the fresh stuff like lettuce, goat cheese, and mushrooms. We’ve been having salad every meal and still have one more to go for lunch today. 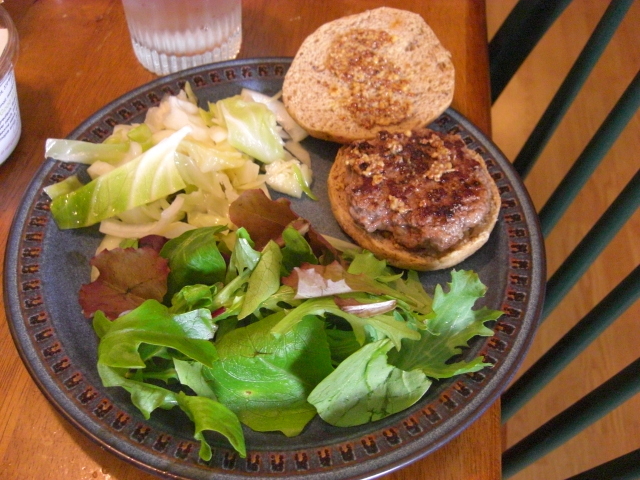 Last night we had mushrooms, onions, celery leaves, and stems along with our salad. And finished off the sweet potatoes. 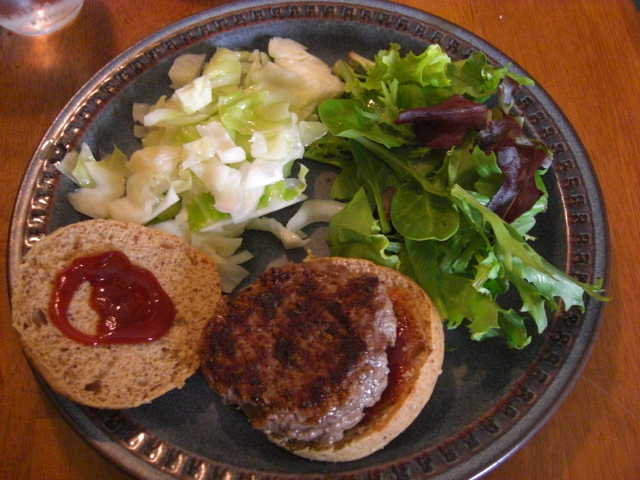 For lunch, I made two small burgers that fit on the honey flax wheat rolls. And salad. Dump it on friends and neighbors. While Chris enjoys the challenge of consuming everything, I’m often happier finding produce a new home. Heads up, Lucy: cabbage, spinach, cilantro, and maybe lettuce coming your way. This week I ordered some ground beef to make and freeze a shepherd’s pie. So I made mashed potatoes and chopped up hordes of celery, spinach, and onions. This plan’s a good one because you use your produce and you have ready-made meals when you get back. You can freeze pretty much any casserole. Another good choice is making and freezing vegetable soup. It’s especially nice after a week of rich food. I processed all the celery. 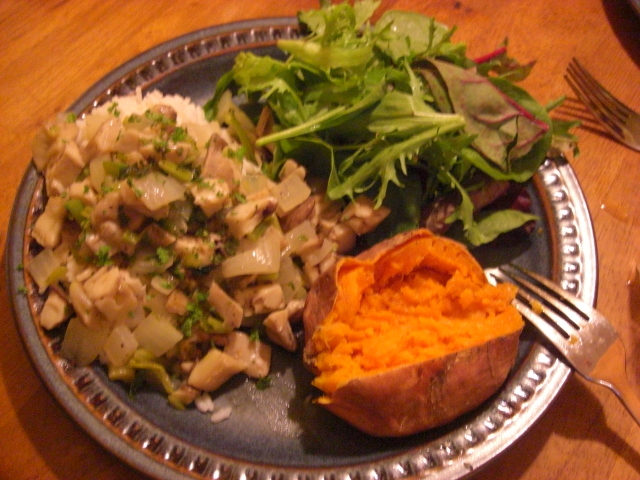 The leaves and stems went into mushroom pilaf and shepherd’s pie, which left the celery stick ends. Usually, I’d eat these fresh, but with no time, I chopped and froze them for future soups and casseroles. According to Mark Bittman, leeks wrapped loosely in plastic will last for weeks in the fridge. We’ll see. The “it’ll-be-fine-just-leave-it-in-the-fridge-till-we-get-back” plan works for hardier stuff like cabbage, kale, carrots, eggs, and hard cheese. When in doubt, though, try one of the other ideas. Thanks for the presents on the porch!